I was kindly invited to speak at the Brussels Twitter Festival. Here’s some of what I talked about, and some of what I didn’t. If you’re planning to live tweet an event or host a Twitter chat, you’ll find plenty of guidance and success stories at Twitter’s new media blog. But here’s the thing. The blog only mentions high profile stories that have engaged many thousands, sometimes millions, of Twitterers. When you’re the US president, Pitbull or the Pope, it’s relatively easy to gather an audience around realtime tweets. But for us mere mortals, there’s no such guarantee. Not unless it’s a “happening” an audience wouldn’t want to miss. 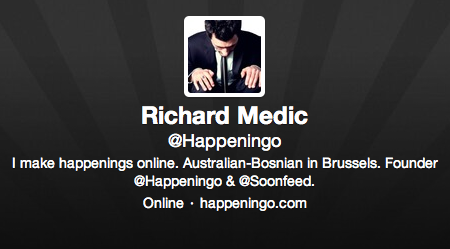 So how do you turn your live tweets or live chat into a Twitter happening? Here are three ingredients (almost) all happenings have in common. Twitter has become a home to communities (niches, tribes, target groups, call them what you will) formed around influencers, hashtags and misspelt keywords. If you’re not an influencer yourself, you’ll need to tap into a community by tweeting with a hashtag associated with it, or by enlisting the support of an influencer within a community. If you try to reach everyone, you’ll connect with no-one. The Chat Diary includes thousands of regular Twitter chats hosted by influencers in all kinds of niches. If you’re planning a live chat, add it to the site for free. If you’re planning live tweets, the site can help you identify communities and influencers to tap (EDIT: The Chat Diary has been taken down since I posted this… hopefully not for good). And if you’re looking for communities whose hashtags are trending right now, check out Hashtags.org. While you’re most likely to gain traction within a community that’s small, your happening can connect with larger communities if it addresses a real need. This happened last month for one of my clients, the European Union’s job mobility network in Spain (aka EURES). Their manager in Madrid took over a European Commission Twitter account to host a 60-minute Q&A for Spanish jobseekers. In a country with Europe’s highest unemployment rate, it was little wonder that the chat attracted press coverage and over 2,000 new followers (a 10% increase on total followers). Have you ever followed live tweets or a Twitter chat for more than an hour? Either have I. In fact the average attention span of a webpage visitor is less than that of a goldfish. How long should a happening last? To engage a community in realtime, your happening must be short. If you’re live tweeting an event, keep it between 15 and 60 minutes. If it’s a Twitter chat, then 60 minutes tops. Alan K’Necht hosts #SocialChat, a weekly Twitter chat so popular it’s been known to trend globally. Prelim #socialchat stats 70 unique participants & over 1,000 tweets in 60 minutes. Best numbers ever! I asked Alan if most participants stick around for the whole hour. Even the most popular chats struggle to keep a community engaged for a full hour. Keep them short. If you’re planning to live tweet or live chat from an event with a fixed agenda, your happening/s should focus on the most compelling event content. If your tweets don’t depend on an event schedule, identify a start time by learning more about your target community members. Which time zone are they in, and when are they tweeting most? Another tactic is to ask yourself this: if the happening were a TV show, what time would it start? Every happening tells a story. And the most compelling stories include the 5Cs of context, challenge, conflict (as in tension, not bloodbath), climax and change. If you’re planning live tweets or a chat at a scheduled time, that’s your climax. So establish a context, challenge and conflict beforetime that compels your audience to join the climax in realtime (and to spread the story “aftertime”). Most of the one million tweets about Nik Wallenda’s #SkyWire walk across the Grand Canyon were posted before and after it happened. If your realtime tweets are unscheduled (as with breaking news and spontaneous situations), you won’t have the luxury of kicking off the story “beforetime”. In such cases you’ll need to establish a story in a matter of tweets, as Elan Gale did in this mid-flight exchange with “Diane” (in fact Gale milked his happening with a second climax when he revealed the incident to be a hoax). I’ll be writing soon about using Vine, live video streaming, widgets and hashmobs in your Twitter happenings, so sign up for updates in the form below, or follow me on Twitter @Happeningo. 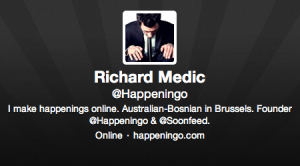 Richard Medic is Chief of Happenings at happeningo digital agency and founder of Soonfeed, a timeline to announce your scheduled live tweets, Twitter chats and any happening online.